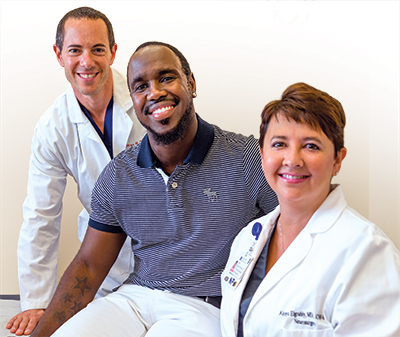 Felix Edens, center, with Neurosurgeon Jeffrey Dembner and his clinical practice manager Alonya Elgrably, N.P., four months after surgery. His mother called the Center for Primary Care, which referred Felix directly to the NorthBay Medical Center Emergency Department. Felix had been diagnosed with congenital hydrocephalus when he was born, a rare condition where fluid collects in the brain. It is most often treated by surgically inserting a plastic drain tube, or shunt system. The shunt diverts the excess fluid from the brain to another area of the body where it is naturally absorbed. Felix had received the shunt as a baby, and in his case, it ran from his brain into his abdomen. For 30 years, occasional headaches were the only reminder Felix had of his shunt. But that was about to change. In the Emergency Department, an ultrasound revealed a cyst pushing up against his kidneys. The cyst was caused by an infection that had started at the tip of his shunt. It was a rare, but not unheard of, side effect of the shunt. The following morning he underwent abdominal surgery to remove the cyst and was placed in the intensive care unit (ICU) on IV antibiotics. But the stubborn infection remained. Three days after his first surgery, Felix and Dr. Dembner began the journey that would restore the young man’s health. In the first of what would be three surgeries, Dr. Dembner removed the shunt from his abdomen. Felix remained in the ICU receiving strong antibiotics, but the infection was tenacious. In a second surgery, Dr. Dembner removed remnants of the shunt from his brain and add a new drain. In the days that followed, his infection was cured. “At this point, we discussed whether Felix even needed a new shunt,” Dr. Dembner explains. But within a few days Felix began to experience painful headaches caused by too much fluid pressure in his brain. He needed a new shunt, and in a final operation, Dr. Dembner placed the plastic tube, which this time drained into a chamber of his heart. Felix spent a total of three weeks in the ICU on IV antibiotics. He has nothing but praise for Dr. Dembner, his ICU nurses and Alonya Elgrably, nurse practitioner and clinical practice manager for Neurosurgery. In June, Felix and his mother returned to the ICU to thank everyone who helped in his recovery.